If you had told me – or most other Americans – back in the 60s or 70s that the dinner menu included raw clams the reaction might not have been violent but more likely than not unfavorable. Then came sushi and, soon after, ceviche. There was a hint of “adventure food” in the way they introduced themselves to America. Now, though, there are other classes of related dishes that retain the power to surprise if, happily, no longer exactly shock: crudos, tiraditos, aguachiles and the like. They still have a whiff of the exotic about them, but they are an established part of the American culinary landscape. About all they have in common is that they are (1) built around raw or mostly raw seafood (for the most part) and (2) delicious. There are differences amongst these classes of dishes. Some of the differences are country of origin. Sushi and sashimi, of course, come from Japan. Crudo and carpaccio are Italian. Mexico joined the party with aguachiles and cocteles. While Ecuador might dispute Peru’s claim to having originated ceviche, tiradito is — with its Japanese influence — indisputably Peruvian. Other differences are in the dishes themselves. The Japanese and Italian dishes tend to be truly raw. The Latin American versions, in contrast, tend to be “cooked” in acid (citrus) to varying degrees. 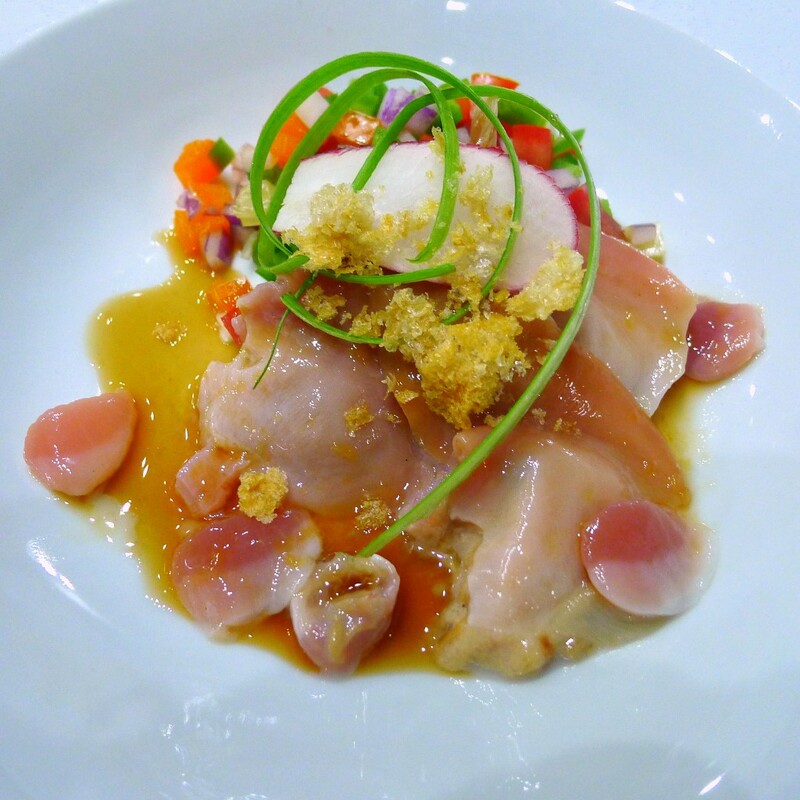 Internationalization and creativity have blurred the lines between the classes of dishes. Names and labels no longer exactly tell the full story. 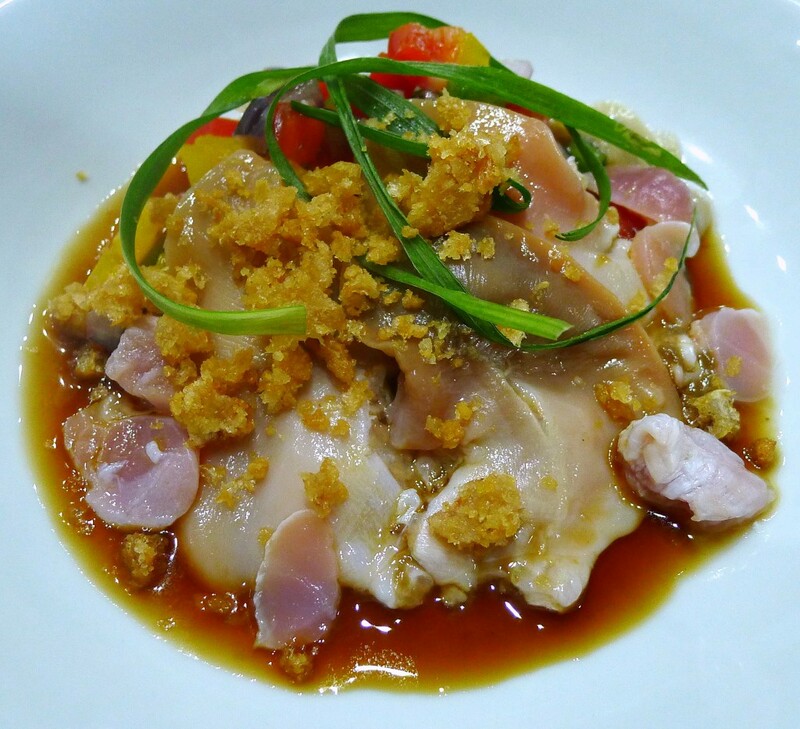 Raw fish dishes are naturals for Southern California (with its miles of coastline) and Baja California (the third largest peninsula in the world). Very few high-end restaurant menus in Baja do not include multiple takes on the theme. Increasingly, the same is true North of the border. I chose to use Pismo clams from Popotla, a wonderful and increasingly storied fishing village south of Rosarito Beach in Baja California. In San Diego, your best bet would be Chocolate Clams (so named for the uniformly brown coloration of the shell, not the flavor) from Catalina Offshore. For best results, as soon as you get the clams home cover them in sea water (or tap water with sea salt at the rate of 2 tablespoons per quart). The concept of the dish is to pair the clams with Baja-style flavors and textures. The sauce incorporates Asian flavors so prevalent in the new cuisine of Baja (aka “BajaMed”) as well as the Clamato juice familiar from mariscos stands throughout Mexico. Chicharones provide a textural contrast. If you cannot find freshly made ones (which you can in better Latino markets), supermarket versions will do. Open the clams. Grasp a clam, joint side down in your non-knife hand (in a glove, towel or other protection) and position it on a cutting board so that the rounded lips opposite the joint are facing upwards. Insert your chef’s knife between the clam’s lips and rotate your knife downward toward the joint until you feel it cut through the abductor muscle and the clam’s resistance suddenly dissipates. Over a bowl (to collect the clam juice either to add to the sauce or reserve for another purpose) do the same going the other direction, then twist the knife and pop the clam partially open. Pull the shell halves apart with your fingers, it will not be remotely difficult. 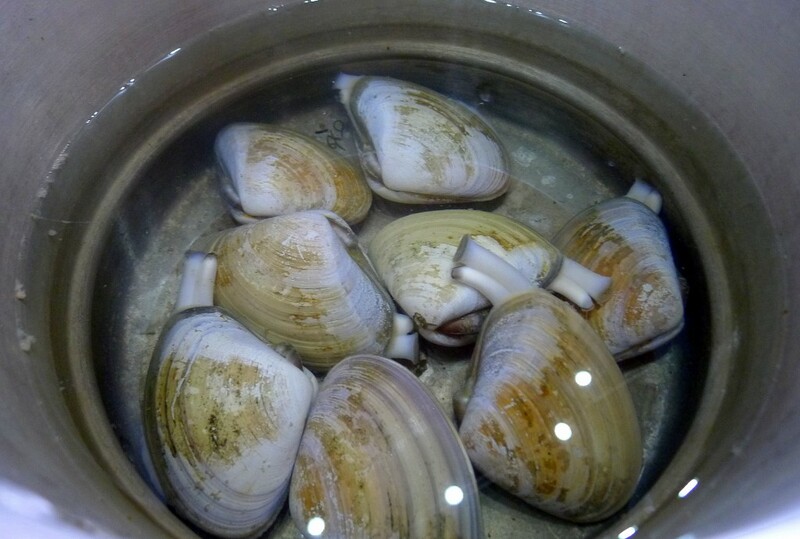 Remove and clean the clam meat. Cut the “tongue” – the large center foot — out of the clam. Holding the tongue, identify the brown, gooey light orange material (neither of which is even a little bit tasty) and rub it off. Give it a quick rinse under running water. Returning to the shell, identify the four red discs – the clam’s abductors (quite tasty). Using a paring knife cut as much of these off as you can. These are good! You want as much of these as you can get. These go into your clam storage bin. Reserve both the tongue and the abductors for later. Discard the remainder unless you have a very small local Venus in which case you have some good clam shells and an excellent Botticelli-style photo op. Prepare the peppers and onion. Give the peppers (both sweet and chile) and red onion brunoise cuts (about 1/8 inch dice), storing each separately in small bowls or other prep containers. Combine them as you like, depending on your heat tolerance and with an eye towards a variety of colors. Start by using twice to three times as much sweet as chile pepper. Prepare the remaining ingredients. Slice the green onions lengthwise into long strips. Run the back (non-sticky side) of the strips, one at a time, over the back (not the sharp side) of your chef’s knife so that they curl up nicely. Crush the chicharones to the point they are just short of a powder and still crunchy. If using the radish, slice it very thinly (on a Benriner, other mandoline or with your knife if you have mad knife skills). Make the sauce. Combine and whisk all of the sauce ingredients in a bowl. Plate the Dish. Separate the clam parts (tongues and abductors). Mound the brunoised peppers and onions toward one side of each plate. Arrange one fourth of the clam tongues on top of the vegetables on each plate. Arrange one fourth of the clam abductors around the tongues. Spoon some of the sauce over and around the clams. Garnish with chicharones, radish (if using) and several of the green onion strips. Note 1: Most clams, if healthy, will be slightly open when you go to open them. If they are not, however, you can induce them to open by placing stubborn ones in a bowl of very hot tap water for up to three minutes. If they are not open at that point you don’t want them to open. Note 2: Do not operate your bivalves on alcohol.